Hey Guys! I just found a new pin and thought I'd share how to find it with you! So this week's collectible pin is the stone hammer pin. Fits the theme for the Prehistoric Party. Soooo to find this go to the dock!!! Club Penguin Puffle Rescue Cheat - Get Free Coins! New Pin: The Banana Peel Pin! New Pin: The Superhero Pin! New Pin: The Camera Pin! New Pin: The Conch Pin! New Pin: The Candy Swirl Pin! Free Daily Items Early? You Too Can Get Them Earlier! New Pin: The Bonsai Tree Pin! New Pin: The Blue Fish Pin! New Pin: The Hot Sauce Pin! New Pin Cheat: The Crystal Ball Pin! Glowing Pumpkin Head UNIVERSAL CODE! The Snow Cone Pin and The Milkshake Pin! New Pin: The Balloon Bunch Pin! New Pin: Tiki Mask Pin! New Pin: The Stereo Pin! ***FIXED***I Got Banned For 72 Hours!! New Puffle Pins: The Medieval Shield! April Fools Day! Two Pin Special! White and Yellow puffles. New Pins: The Purple and Pink Puffle Pins! New Pin: The GREEN AND BLACK Puffle Pins! 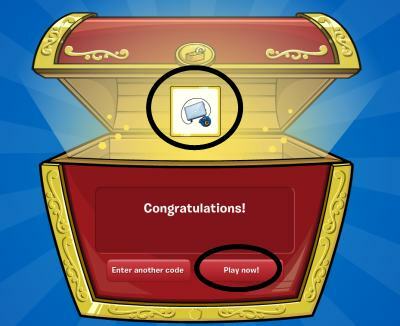 Awesome Cheats For Non-members At The Puffle Party 2011! New Pin: The RED AND BLUE Puffle Pins! New Pin: The Fire Extingisher Pin! New Pin: The Sleeping Bag Pin! New Pin: The Party Favors Pin! New Pin: The Snowflake Pin! New Pin: The Water Pin! New Pin: The Water Tap Pin! New Pin Cheat: The Bat Pin! New Pin Cheat: The Carrot Pin! New Pin Cheat: The Sandwitch Pin! New Pin Cheat: The Fair Ticket Pin! New Pin Cheat: The Igloo Pin! New Pin Cheat: The Carabiner Pin! New Pin Cheat: The Compass Pin! New Pin Cheat: The Tambourine Pin! New Pin Cheat: The Candy Apple Pin Cheat! New Pin Cheat: The Lightbulb pin! New Club Penguin Pin: The Seashell Pin! New Club Penguin Pin- The Cream Soda Barrel Pin! New Pin: The Shield Pin! New Club Penguin Pin: The Leaf Pin! New Club Penguin Pin: The Frog Pin!! New Club Penguin Pin: The Boot Pin! New Club Penguin Pin: The Wagon Pin! Club Penguin Pin: The Golden Feather Pin! New Club Penguin Pin: The Firework Pin! New Pin Cheat: Hot Chocolate Pin! New Item In Ninja Catalog!!! Club Penguin Pin Cheat: Dojo Lantern Pin!!! Ice Cream Sundae Pin Cheat! New King's Crown Pin Cheat on Club Penguin!!!!!! !